Argo Flares are increasingly being called upon to undertake photographic surveys of the flare deck as well as the flare tips on offshore facilities. With a similar ageing process to that of the flares, a flare deck including flare noise and radiation shielding, handrails and grating can deteriorate over time and cause a similar amount of disruption to the operation of an offshore facility if found to be unsafe. This ageing process needn’t be problematic providing that potential problems are identified in ample time to enable them to be addressed during the next planned turnaround. This is best achieved by using our helicopter flyby service and requesting additional photographs of flare deck covering. Argo Flare Services, as a matter of course, make note of any visual defects to the flare deck radiation shielding as well as other associated equipment, when they undertake either an intrusive hands-on Flare inspection or a helicopter flyby inspection. Replacement flare deck noise shielding and radiation shielding is of a similar delivery time to that of replacement flares. Argo can deliver both in order to minimise the number of interfaces and keep to agreed time schedules. 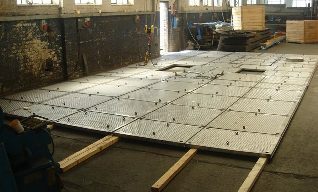 Argo also works very closely with the helicopter companies to ensure that the replacement decking is designed and supplied in such a way that it can be lifted and installed safely and efficiently. It should be noted that carbon steel hand rails used and left in-situ on flare decks can be totally destroyed within a very short period. It should also be noted that any disruption to the usual burn pattern of the flares, for example a cracked or split flare body or leaking flange joint can also rapidly deteriorate the condition of the flare deck shielding. Typical materials are grade 316L stainless steel and 800H, with a typical life expectancy of between 7 and 15 years. Where possible Argo Flare Services works with the original manufacturer of the flare deck shielding, but also has the capacity and experience to undertake the design work in-house.